Samsung Galaxy J2 is one of Samsung’s newest budget phone and it has taken a remarkable change of design; for the first time in Samsung’s budget phone category, they had removed the physical home button, which means you will be using only the navigation bar on the screen. Why Samsung removed the button we’re not entirely sure spacewise, because the space that houses the now non- existent home button is still there but it was replaced by the brand name. We’re thinking it’s for ergonomic purposes since people who are used to the home button might need some adjusting before getting used to it. It could also be because it is rather redundant to have the physical home button when it’s on the screen itself. The Samsung Galaxy J2 doesn’t look much on the outside, it doesn’t have aluminum casing or glass back cover but that’s also one of the reasons why it’s so affordable. Hey, do you want a quick and easy way to sim unlock your Samsung Galaxy J2 from MetroPCS? Click here. 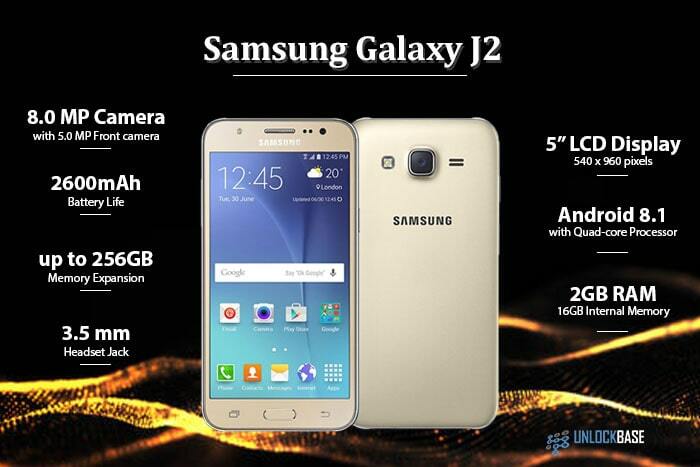 Samsung Galaxy J2’s build and design is on par with the rest of the Android phones in the budget department. We compared it to 3 other budget phones that retails for the same price (LG Aristo 3, Alcatel A30 Fierce, Samsung Galaxy J3 Prime Silver) from Metro by T-Mobile (previously called MetroPCS) and there seems to be no significant difference among them (comparison shown in the table below). The J2, however, is considerably heavy for its height, weighing 5.8 oz at just 6 inches long. It has 5 inches of screen display on a Corning Gorilla Glass, with a 540 x 960 resolution on a 16:9 aspect ratio. It’s a bummer that it has a lower resolution compared to the LG Aristo 3 which has a 720 x 1280 resolution on the same screen size for almost the same price. To sum it up, it doesn’t have a stand out appearance and only has the standard look of most Samsung budget and mid-range phones. Do you want to permanently unlock your phone with the Device Unlock App? Let us help you. The Samsung Galaxy J2 again doesn’t have an ‘edge’ above other budget phones of the same price, aside from bearing the brand name you trust. Nonetheless, its specs don’t really disappoint; it has a huge battery, a good processor, and solid cameras. It has 5MP front-facing camera and 8MP main camera with LED Flash. However, these cameras don’t have instant focus or PDAF (Phase Detection Autofocus) and that means it might not be that great for selfies as it is for still images. Compared to Alcatel A30 Fierce, it has lower camera specs, because the American brand features a 13MP rear-facing auto-focus camera that has an LED flash and a 5MP front-facing wide-angle camera with LED flash as well. If you’re about taking great selfie photos with a huge group, the Alcatel A30 Fierce has a better chance of nailing it than the Samsung Galaxy J2. On the other hand, the battery is quite large but still not as huge as the Alcatel A30 fierce, which has a 3000mAh battery size. The Galaxy J2 only has a 2600mAh but still could last you a day of use. The security features of the Galaxy J2 are not as impressive as the rest in the budget phone department. It doesn’t have fingerprint sensors like Alcatel A30 Fierce or Face Unlock which is present in LG Aristo 3. Guidelines and steps on how to perform permanent unlock with MetroPCS device unlock app. Is Samsung Galaxy J2 Worth Upgrading To? If you value trust for the brand, Samsung Galaxy J2 is not bad for the price, although it could have had better specs to keep up with its competitors. It’s not the best Samsung budget phone we’ve seen so far, but we think that losing the home button is one of the remarkable changes the brand has adapted for all its budget phones. Without the home button, the phone is still intuitively easy to use, that is, of course, if you’ve been a long time Android user. If there was anything significant that we wanted Samsung could have changed, that is adding a fingerprint sensor. Undeniably, that’s something that makes every budget Samsung phone look and feel so out of date.